Doors are a critical part of modern civilization. That said, it only makes sense that door locks are an essential part of our lives. Door locks provide safety and security like no other tool or appliance. They act as a barrier to keep your home or business safe and help maintain your privacy. It is estimated that two million residences are broken into each year, so understanding the types of door locks to use is important. Knowing your choices and details about various door locks will help you make a more informed choice. Maybe you are considering updating the door locks on your home or business or perhaps you are just curious about what type of door locks are available. Either way, we are here to provide you with an informative look at the types of door locks available for residential and commercial use. 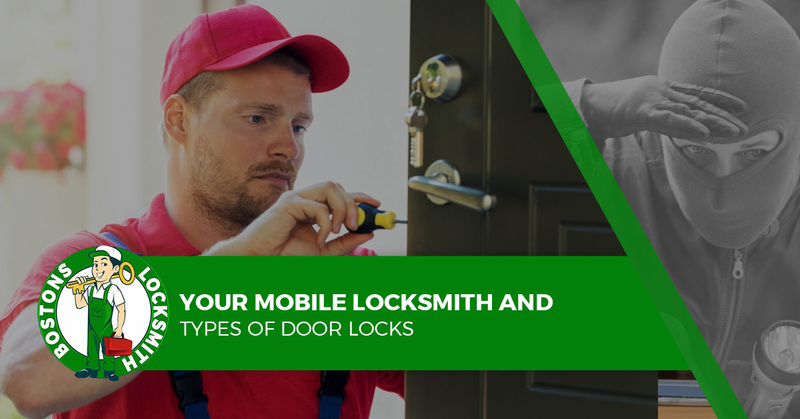 Bostons Locksmith, your mobile locksmith in Boston, presents the types of locks you can use on your home or business doors. Knob locks are one of the most common types of door locks. Knob locks are used on all types of doors. These locks have knobs on both sides, one side has a keyhole and the other side has a manual lock. Because the locking mechanism is actually inside the knob, it can be easily accessed and broken into. Thus, a knob lock should not be the main security lock on a front or back door. Combination locks require a certain sequence of numbers, symbols or letters to be opened. Combination locks come in a variety of forms including single dial, multiple dial and even electronic. Combination locks are commonly used on school lockers and safes. Electric locks work like many other types of locks, the only difference is that they are not manually applied. The mechanism that locks and unlocks the door is electronic and can be opened either by a code on a keypad or a key. The great thing about these types of locks is that they cannot be overridden by brute force or a lock pick. Basically, forced entry requires rewiring the entire system. It can be done, but it takes somebody with expert level skills to do and even then, it is a tough job. Just as the name implies, these are locks that don’t require a key for entry. The door is locked and unlocked using a code that is entered into a keypad, making it a quite secure lock. Typically, keyless locks employ a deadbolt. But since there is no keyhole, there is absolutely no danger in having someone pick the lock. Deadbolts are the old standby for all types of exterior doors. Deadbolts provide security with the use of a metal cylinder that protrudes through your door jam and into the wall for complete security. You will find deadbolts used in tandem with door handle locks as an added level of security. Since deadbolts require a key to be locked and unlocked from the outside, they are technically vulnerable to lock bumping and picking. However, they are quite secure for residential homes and provide a sense of security. Padlocks are the most common type of freestanding lock and are easily identifiable. They are a popular style of lock and have thousands of uses. You will see them quite often on lockers, shed doors and gates. We don’t recommend you use them on your house doors. If you have any questions or concerns about door locks and which ones will work best for your home or business, we will be more than happy to help. Give Bostons Locksmith a call today.